Welcome to ChevyJoltEV.com! This is a website dedicated to an idea of what could be the Chevrolet Jolt EV, a long-range, pure electric sports car. And if you are asking yourself, “Wait… so the Jolt EV isn’t going into production?” No, it is not. But, based on the reponse from the world (literally) on May 4th, 2016, it should. Creating the idea of the Jolt EV and taking this website live along with supporting social media assets was a passion project. I was curious to see how consumers would respond to a traditional auto manufacturer releasing a sporty, long-range EV supported by a robust charging network through dealerships in the United States. The response was overwhelming. And not just to me personally. The Jolt EV website received so much traffic that it crashed and I had to setup a new server to handle the traffic. At first my hope was that someone from the EV enthusiast realm might find the idea compelling and write a blog about it. Instead, I was inundated with responses from consumers around the world who expressed their excitement for a truly sporty, long-range EV. The result: in only 48 hours the very idea of the Jolt EV being a reality prompted responses from all 50 states in the U.S., visitors from over 100 countries and over 20,000 unique visitors to the website. That is beyond what I expected, but exciting to say the least. Like many, I have heard that the reason a wider variety of EVs are not being pursued or produced by traditional automotive manufacturers is that there is no demand from the public. If my own project can produce this kind of response, I think it is time we put that theory to rest. Consumers from around the world clearly want more compelling EV options. So, why do this? One Twitter user, @tweetermeyer, asked very candidly, “Maybe this is fake… but who would fake it?” Well, I would. And why? Because developing more electric vehicles matters. And with the power of the digital age, we don’t have to wait to hear the news, we can make it on our own. I figured if traditional auto manufacturers weren’t going to develop more compelling EV options to excite consumers, I would help. And oddly enough, I have done it before. So, who am I? My name is Matt Teske, and I am a branding and marketing consultant that has spent over 17 years working within the automotive industry. Like every “car guy”, I started young, mesmerized by fast cars and design. My first car was a Chevrolet Cavalier Z24, and oddly enough I chose it to stand out from the crowd because the rest of my friends were buying imports. I wanted to be different and at the time no one my age ever considered looking at GM small cars. There were no aftermarket parts available and no real excitement for GM brands, so why bother? I saw that as an opportunity and a fun challenge. Long story short, over the course of a few years and through designing and building my own car, I had helped to change the trajectory of GM small cars. The proof was when General Motors requested to borrow my vehicle to take it on a national tour with their in-house show cars. This lead to a career of branding and strategy consulting, and managing new vehicle projects for manufacturers, including with Chevrolet again for the Cobalt. One GM executive once candidly told me, “Your work captures the attention of the market far better than our in-house teams can.” I feel like its time that I reprise that role. Two years ago General Motors decided to prove to the world that Chevrolet was still in fact an innovative and nimble automotive brand by unveiling the Chevrolet Bolt EV. From concept to production, the process was expedited and soon we will get to see what Chevrolet has to offer in a long range, pure electric car. It was the evidence that many consumers needed to see that innovation in transportation was finally being addressed by traditional automakers. The Chevrolet Bolt EV is a great first step, but not enough. There is HUGE demand and interest for more EVs, and variety is lacking heavily in the automotive market. Don’t believe it? Just ask one of the 400,000 or so people world-wide that are currently reservation holders for the Tesla Model 3. The hard truth is that traditional automotive brands are not equipped to address how the digital age has transformed buyers expectation for automobiles, and they also have concerns for how it will disrupt their business model. You can read more about how the digital age has impacted our perception of automobiles here. But Chevrolet has stepped up and developed a true EV platform, which is exciting and opens up many doors for opportunity. Now all of the pieces to the puzzle exist to build more EV designs that appeal to a broader audience. Unfortunately, it appears that General Motors lacks the motivation. And I get it, when you sell a truck or SUV you make a ton of money. But as history has proven innovation is where consumers invest their money and loyalty, and right now they are hungry for game changing vehicle options. Recent images of the thousands of consumers standing in line to reserve an electric car similar to buying an iPhone proves this entirely. And no one is hoping to “Blockbuster and Chill” this weekend either. I think you get my point. Enter my idea for the Chevrolet Jolt EV. As a design, this vehicle was originally unveiled in 2012 as the Chevrolet Tru 140s, one of the best concepts Chevrolet had released in years. Targeted at younger buyers, it carries a strong design language, bolstering Chevrolet’s signature grille, while embodying the look of an exotic that could be obtained by the masses. And while this particular design is not for everyone from a utility perspective, it could help to usher in a new era of brand loyalty from both young and affluent buyers that Chevrolet and other traditional auto makers are always seeking. This new brand loyalty will not be secured by looks alone. It must also showcase the technological advancements that consumers now expect, and we know exists within General Motors thanks to the Bolt EV. And when it comes to electric cars, the planning goes beyond the car itself. Infrastructure and fast charging are a vital component for success. And while Chevrolet recently stated they have no plans to support build out of highway fast charging infrastructure, they are forgetting one of their most valuable assets that needs a refresh in consumer perception: dealerships. And isn’t that the goal? To continue to drive people to dealers? 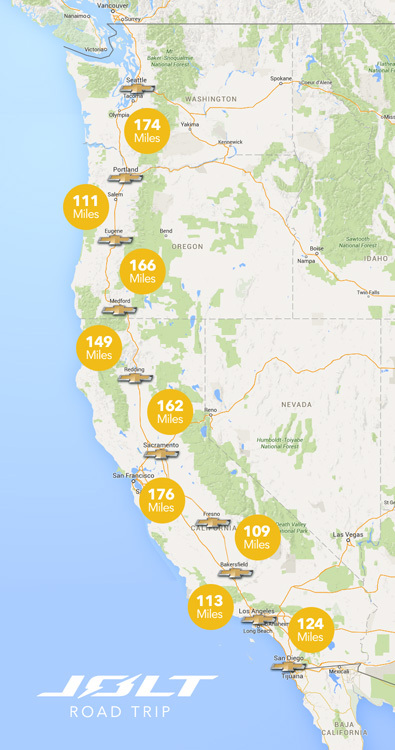 Utilizing the network of 3,000+ Chevrolet dealerships across the U.S. is not a perfect solution for long distance EV travel, but it is a logical start. It requires little effort by the dealerships as well. They simply install a handful of CCS DC fast chargers and make them accessible 24/7 to Chevrolet EV owners. The next step is to get in your EV and enjoy. A Chevrolet EV that delivers 200+ miles of range can easily drive from Seattle, WA to San Diego, CA using this type of charging network. In the end, my goal with building this website, the brand of Jolt EV and the supporting assets, is to prove that the market is hungry for more EV options. Chevrolet has a golden opportunity to combine their new EV platform with one of their existing concepts to produce a very exciting vehicle that will only further cement the Chevrolet brand as the leading automaker on the planet. And Chevrolet, you’ll be happy to know that I am one of your customers. I drive a 2016 Chevrolet Volt and my wife drives a 2015 Chevrolet Spark EV. That said, I am also a Tesla Model 3 reservation holder. But if you were to build this idea of mine, the Jolt EV, and develop an EV savvy dealership network that includes DC fast charging, you will get my business instead. Am I alone in this? I honestly don’t think so. Consumers are hungry for more EV options, and this case study for the Jolt EV just proved that to be true. I only hope that like myself, other consumers longing for innovation from traditional automotive brands can see beyond what has been a lack of vision and truly be excited for the Jolt EV that could be in their driveway in no time at all. The response to my idea for the Jolt EV was truly overwhelming. It is exciting to see that there are so many consumers like me interested in more variety and support in electric vehicles from traditional automotive brands. Out of respect for General Motors and the Chevrolet brand, I have updated the Jolt EV website to reflect what it truly is: a personal website created by a Chevrolet customer and EV enthusiast who is excited to see more progress and options for electric vehicles available to consumers both in the U.S. and around the world. So now what? For me, I think the answer is clear: consumers from around the world want to see a variety of new EVs brought to the market from traditional automotive brands. And to those manufacturers who take the lead to innovate, inspire, and produce more EVs, consumers like myself will give you our business. If you are interested in chatting with me, please reach out at the contact info below. I am excited to see where the conversation and innovations go from here. Thanks again for coming by ChevyJoltEV.com! Copyright © 2016 ChevyJoltEV.com. All Rights Reserved. This website is not affiliated with General Motors or Chevrolet. Original vehicle images courtesy of Chevrolet.